Firstly I want to start by saying I have no objection to detox’s or cleanse’s. These can be fantastic for preparing your body pre-diet/lifestyle change. But what I object to is all these diet plans where you pay someone silly money weekly or monthly, and they have all these fake meals you can eat which they sell you, and instead of teaching you about the real nutritious value in foods they teach you purely to calorie count, or worse still have their own method entirely for counting your food intake, which has no real relation to real life. When you come off that diet, recreating that low calorie ‘healthy’ shepherds pie they sold you, or learning how to snack without turning to special k bars, becomes seriously difficult. The other thing a lot of these diets seem to teach is that fruit and vegetables are so called ‘free foods’ and you can eat as much of these as you like. Some fruit is so high in carbohydrates and sugar you could have a bowl of wholewheat pasta for the equivalent in carbs. Nuts and seeds, these are also healthy and great for you, but you can’t be snacking on almonds and bananas all day and hoping to lose weight. A medium banana contains approx 120 calories and a whopping 30g of carbohydrates. Where as a serving of Sainsbury’s Wholewheat Penne Pasta (100g) contains 145 calories and 28.5g of carbohydrates. A serving of almonds 25g (which by the way is tiny) contains 148 calories and 12.4g fat! So if you are eating things like this and adding them into your diet as snacks, you could be undoing all the hard work you have done. These calorie controlled diets are great if you are very large and need a place to start, but it seems more and more people who only have a stone or two to use are trying out these diets. Calorie counting is great initially when you have 4 or 5 stone to lose. I don’t want anyone to take offence, as I was there myself, but when you are that size it was probably because you didn’t really focus on what you were eating. I dread to imagine how many calories I was eating a day back when I was larger. So if I was told to eat this or eat that in a calorie controlled way, and to limit myself to a certain amount of treats a week instead of having daily treats then of course you are bound to lose weight. When the diet is over however, and they take away the meals, and the special snacks, what are people left with. Counting calories is a great way to keep track of what you are eating, but in order to lose weight, maintain muscle, and also lead a healthy balanced lifestyle you can’t be eating 1500 calories a day of just anything. My fitness pal alongside a lot of other free apps, allow you to track your calories, and also keep track of your macros, counting your fats, carbohydrates, and proteins. You can input your specific goals on my fitness pal, or the app will actually create their own suggestion for you based on your height, weight and weight loss goal. It may sound complicated at first but clean eating is really so simple and I have really found it to be the most effective way of shedding the fat. At first I didn’t quite believe I would lose any size by eating so much food, but with the right balance I have had extraordinary results. Good fats: nuts and seeds, coconut oil, avocados, eggs, fish, chia seeds, extra virgin olive oil, olives, peanut butter/other nut butters, flaxseed. Good proteins: Chicken, lean steak, turkey, ostrich, cottage cheese, eggs, white fish, quinoa, lentils, nuts. Good carbohydrates: Sweet potato, baby new potatoes, wholewheat pasta, quinoa, porridge, green peas. These are just a few examples of the sorts of fats, proteins and carbs I have been eating. Not to say they are the only good ones, or that others are really bad. But I don’t know about you but if for dinner I can have 175g of sweet potato, a 200g chicken breast and 200g of vegetables for under 400 calories, coming in with 45g protein, 5g fat, and 37g carbohydrates. I would much rather have that, that waste those equivalent carbs on a banana and a handful of nuts. I never thought checking the back of packets would be so simple, start with eating clean, and eating the right foods. Snacks don’t really have a place in a strict diet, and if they are desperately needed they need to be clean, real foods. Dieting is the hard part, enjoying the gym is great, but the real work comes into play with food prep and getting your diet spot on. You can spend hours and hours in the gym crunching those abs, but no one will see them if they are under a layer of fat. We all need a bit of a support sometimes, and I totally get that these dieting groups can give you that, but turn to your friends, your family, your friends in the world of social media, follow me on Instagram, let us all lift each other up and motivate each other to carry on! I was having a real craving for something extra chocolatey, and I had enough macros left to give something a try! So here is the creation that came from the craving, Super chocolatey and one really is enough! Prepare a cookie sheet or baking tray and line with baking parchment or tin foil. Combine the coconut oil, peanut butter and coconut sugar in a mixing bowl. Add in the dry ingredients one at a time, the dark chocolate chips and macadamia nuts last. Finally add unsweetened almond milk 1 tbsp at a time, use more or less than the recipe states until a dough can be formed. Split your mix into 7 balls and place on the cookie sheet and flatten with fingers or a fork. Bake in the oven for 20/25 minutes, and leave to cool on the sheet until they firm up. Having two best friends, one vegan and one allergic to nuts, I have found myself pestered with requests to make nut free things or vegan things. 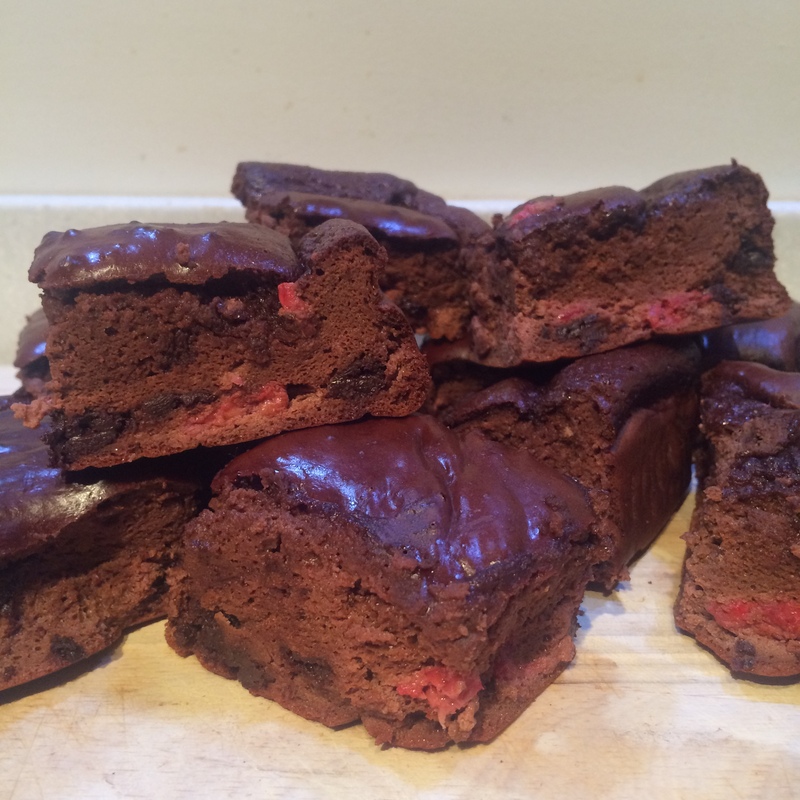 I made the Chocolate and Raspberry nut free brownies last week, so this week it was the turn of the Vegans. I am super happy with this recipe, I did a lot of reading on xanthan gum so I thought I would add that and see what it does. Readily available in health stores and supermarkets, although in my Sainsburys it was hidden away a bit in the speciality foods section. It creates a more solid texture to your bakes apparently, its real use it to replace gluten in gluten free bakes, and I found just a pinch of it really added to the bake, so you will see it popping up again I am sure! 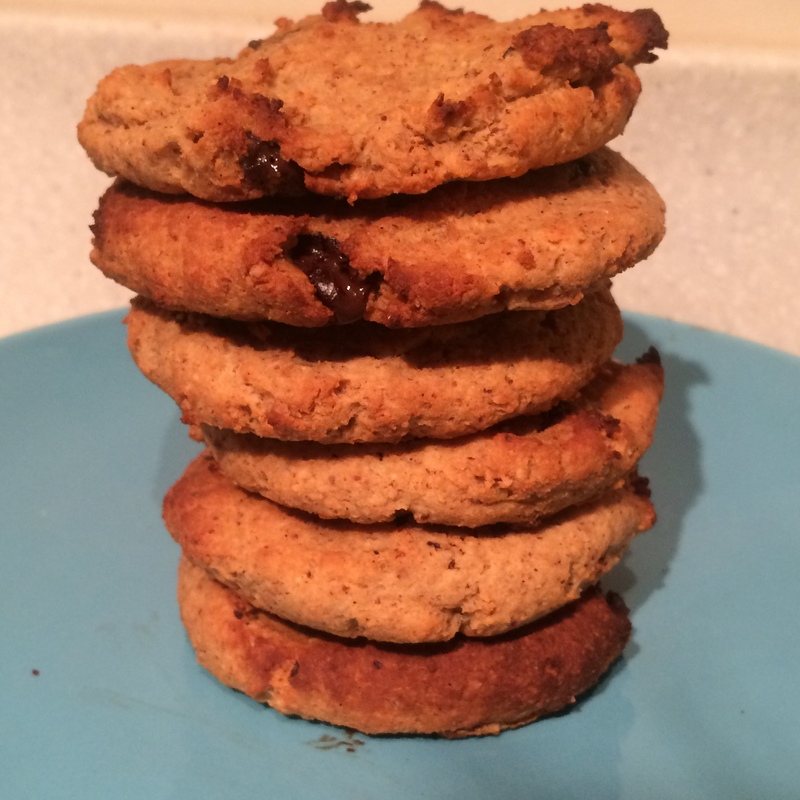 Perfect cookies for vegans and non vegans alike, great with a cup of tea to satisfy a craving. This recipe made me 7, but they were fairly large so you could definitely make them a bit smaller if you wanted. Pre-heat the oven to 180degress/gas mark 4. Mix the almond butter and pea protein together. Add the agave, the blended gluten free oats, and the half teaspoon of xanthun gum. Slowly start adding the almond milk, do not use the whole 5tbsp if you don’t need it. Just add until the mix forms a dough that can be handled with your hands and separated into balls. Split the mix into 7 round balls, and flatten to bake on a prepared tray. Leave to bake in the oven for 15-20 minutes and allow to cool on the tray before removing and allowing to cool fully. I am on a mission to create a fantastically satisfying protein brownie, I tend to plunge for ingredients such as almond butter for bakes like this, but I wanted them to be lower carb and importantly NUT FREE. My best friend is allergic to nuts, and recently the flat we share together has been full of delicious smelling protein bakes…none of which she has been able to eat! When I came home today and said I was going to bake some brownies, she virtually begged me to try, as I keep saying I will, to make something nut free. So here goes! I imagine my protein brownie mission will be ongoing, and often not nut free, but I am pretty pleased with how these turned out. Very satisfying when you need that chocolate fix. Allow Philadelphia to soften outside of the fridge, combine with the chocolate whey protein powder. Add chocolate into the mix along with all other ingredients. Mix thoroughly and pour into a brownie tray. Bake for approx 20 mins checking half way through. They may still be a little wet when you first take them out as with most brownies, so let them finish cooking outside, and cool in the tin. As it was Halloween yesterday, there seems to be pumpkins everywhere. 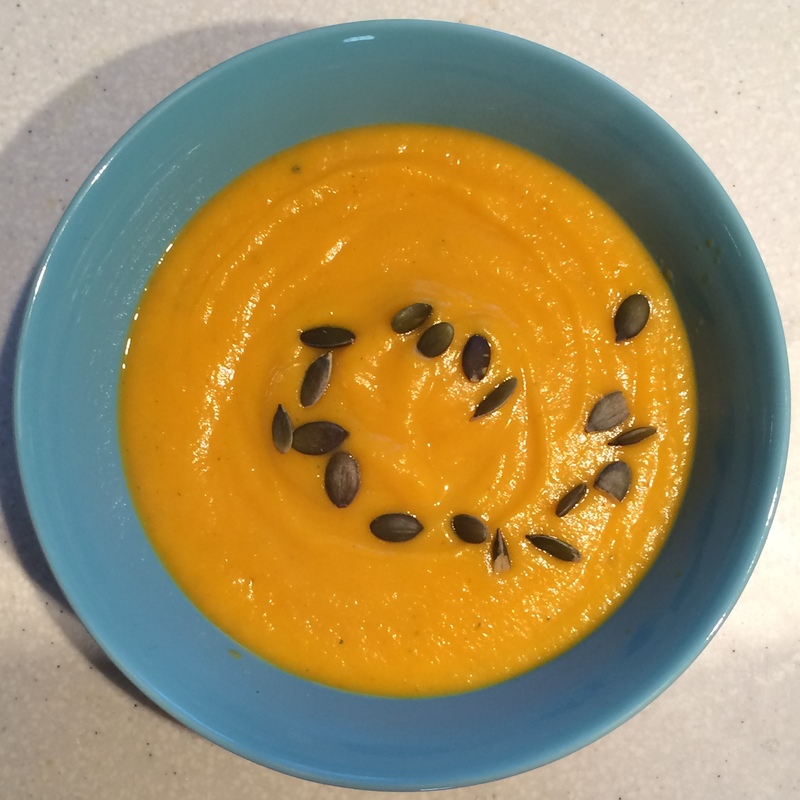 decided to take advantage and use one to make this tasty healthy soup to warm up my Sunday! Soup is so easy to make, and you can switch out and change ingredients depending on what you have at home, and it wont really effect the calories much, perfect thing to make on a Sunday afternoon. I have listed the measurements I have used but if you have more or less pumpkin, just use whatever you have. Slice the top off your pumpkin, scoop out all of the seeds and cut up the flesh into small cubes, slicing off the skin. Peel and chop all the other veg. Put the olive oil into a pan, and add the onions and garlic, let it sweat for about 5 minutes. Add the rest of the vegetables and soften in the pan for 5 minutes while you prepare your stock cube. Add your stock and honey to the pan, add a dash of cumin, coriander, salt, and pepper at this stage, and pop a lid on your soup. Let it do its thing for 20/30 minutes depending on how big your chunks are. Blend the soup up, add more seasoning to your taste, and serve!